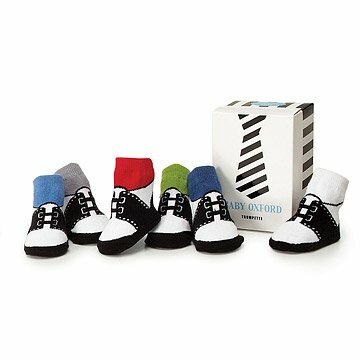 These handsome baby oxfords feature a comfy fabric blend for dapper dressing and impressing. A comfy blend of cotton, lycra and spandex makes for easy dressing and impressing, while no-slip soles prime the transition from stroller to strolling. Set of six, multi-colored infant "oxford" socks. Made in Korea. Machine wash in warm water, do not bleach, tumble dry. This was a special gift for my little nephew... thank you! Fit 16lb 6mo plus room to grow. Will fit 9 month old... may be good up to 12mos. The socks were the hit of a recent brunch. The Socks were a gift for a young couple and their eight month old son. The couple could not have been more excited and we could not have been more pleased. These socks are absolutely adorable and come in the cutest gift box ever!! As previous reviewers have stated, website should say 'Set of 6 PAIRS' not 'Set of 6' . Socks that look like shoes! Very comfortable material and fits well. Good quality. Who doesn't love a baby in adorable socks? I bought this for a unique baby shower gift and now I'm worried that I will just keep it for myself and my theoretical, nerd baby. The baby socks are a saddle oxford design in different colors, such a happy gift for our first great grandchild, a boy. I ordered toute de suite upon seeing them in the catalog and then phoned the order in. Packaging is paramount and the adorable box holding the baby "sox-fords" is perfect. Thank you for the great catalogs, always fun to spend a good time reading. Thank you for the great products. Thank you for the exemplary service and quality. The catalogue stated "set of six". Six individual booties are shown. it should have said "six pair".